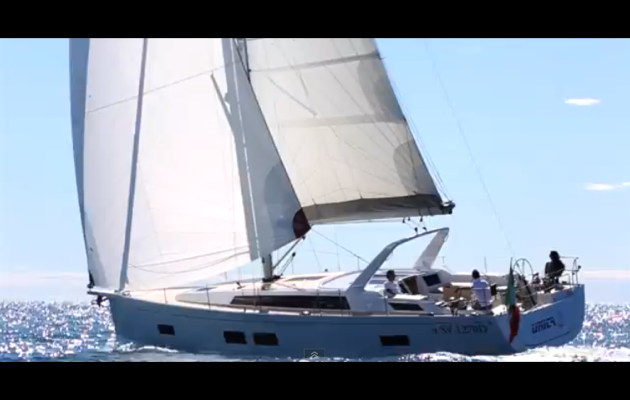 The Grand Soleil 46LC is the first true cruiser from this Italian yard in its 42 year history. It’s one that targets comfortable, Med-style sailing with easy handling and a light and spacious interior. A cruising yacht means different things to different sailors. LC stands for Long Cruise and there are many clues that this Italian brand is targeting warm weather cruising with the Grand Soliel 46LC. For a start the deck is replete with relaxation areas: a double sunbed nestles in the foredeck, there are aft-facing lounger seats in the cockpit and a large swimming platform aft that lowers hydraulically. But these features are matched by practicality in a cockpit that provides protection for its crew by means of high bench coamings and a rollbar-style arch that keeps the boom and mainsheet clear of the cockpit and also helps support a full cockpit bimini. Now you may be forgiven for thinking that this is very similar to many other performance cruisers launched in recent years, particularly by Italian yards. These are typically fast cruisers: lightweight, flat-decked, trendy yachts that can be raced occasionally. But few are proper cruising yachts with hull shapes that will softly part the seas and provide reasonable tankage, a comfortable cockpit and adequate stowage space for long-term sailing. The Grand Soleil 46LC marks the start of a range that will address that gap between the mass production cruiser offerings from French and German yards and high-end – and typically more traditional style – cruisers from northern Europe. The Grand Soleil 46LC is Italian through and through, a design collaboration between Marco Lostuzzi and Nauta Yachts. She has bold looks, straight, angular lines, with big tinted hull portlights contrasting with stark topsides. We travelled to Lavagna, north of Pisa, to test this new model and found she has the space and comfort to enjoy temperate conditions to the full, is nimble enough for light wind sailing and has a light, open and spacious interior. So if the mass production cruising boat options are not quite cutting it, or if you want something a bit sexier, a little more luxurious, a bit classier, a bit quicker … here she is. The full test report features in our December 2015 issue from 12 November.